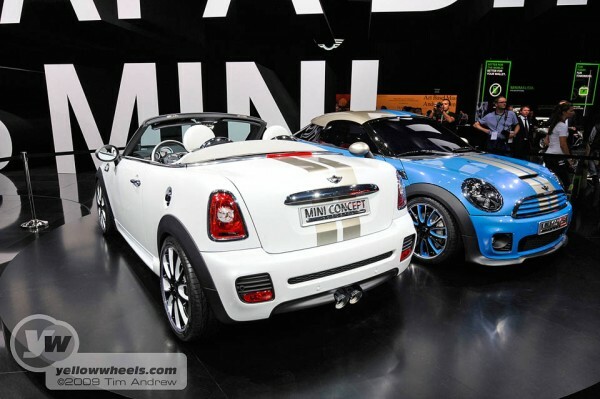 Concept is probably a misnomer as these Minis are slated for production at BMW’s mini plant in Oxford. Revealed at the Frankfurt Show, the coupe had been leaked to the press ahead of the show, but the convertible was the promised second surprise. Both are likely to be fitted with the 1.6 litre turbo Cooper engine, adding to the 1.5 million Minis that have already rolled off the Oxford production line, in this, Mini’s 50th anniversary year. A small caveat; production versions are likely to include less radical screen and roofline profile’s, and as always, more realistic rubber and wheel clearance. The first classic Mini was presented to the public on 26 August 1959. Exactly fifty years on and nearly a decade into the life of new MINI, images of the stunning new MINI Coupe Concept are today released. Capturing the essence of MINI’s sporting appeal, the global press and public will see the MINI Coupe Concept in the metal for the first time when it is unveiled at the Frankfurt Motor Show from 17-27 September 2009. The MINI Coupe Concept is designed to be the most dynamic and agile MINI ever built. Strictly a two-seater, the low roof line, compact dimensions, perfect axle load distribution and lightweight construction are all trademarks of a genuine sports car. A number of design icons feature on the MINI Coupe Concept. Large round headlights inclusive of black internal reflectors, a hexagonal radiator grille and low front spoiler mark the newcomer out as a true MINI. Unique exterior design cues include a bespoke rear spoiler, bonnet stripes extending to include the radiator grille and an entirely revised front air dam. The muscular stance of the car is a result of carefully calculated exterior dimensions. The MINI Coupe Concept is 1,356mm high and the steep rake of the A-pillars is accentuated by the high waistline common to every MINI. Sat on attractive 18” triple-tone finish light alloy wheels, the concept is 3,714mm in length and 1,683mm wide. For the first time on a MINI, the weight-saving aluminium roof is an unbroken bridge shape and flows smoothly from A to C-pillars. The steep front rake stops above the heads of driver and front passenger and descends gently to the rear of the car, emphasising the wedge shape of the car and its sporty poise. The low rear end of the car ensures optimum air flow across the vehicle when in motion and in combination with the roof spoiler, minimises any aerodynamic interruption. Inside, sports seats with strongly contoured side supports feature, as does a three-spoke leather sports steering wheel with multi-function controls. Two Chronoswiss clocks to the right and left of the rev counter provide a close link to earlier concept cars by MINI, bridging the gap between the analogue age of the classic Mini and the digital age of new MINI. One acts as a stop watch and the other a standard timepiece. A luggage capacity of 250 litres is offered and can be accessed at the rear by a tailgate which is hinged above the roof spoiler, meaning easy access to goods stowed in the rear. The bulkhead between the passenger and luggage compartments comes with a lockable opening, giving passengers access to the rear section at any time. 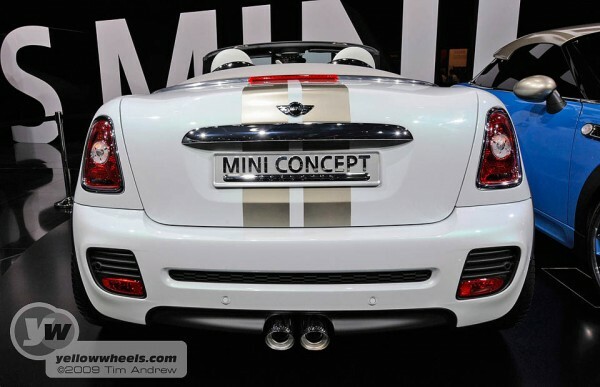 The MINI Coupe Concept is engineered to receive the most powerful engine in the current MINI line-up. The highly-acclaimed 211hp, 1.6-litre twin scroll turbocharged power unit found in current John Cooper Works models offers CO2 emissions of just 165g/km and fuel efficiency of 40.9mpg (combined). MINI’s revered handling dynamics will be a highlight of the MINI Coupe Concept. Front wheel drive, powerful disc brakes on all four wheels, the front axle with McPherson spring struts and a centrally guided rear axle with aluminium longitudinal arms and anti-roll bars guarantee a safe, yet grin-inducing drive every time. With a Crossover model in the final stages of development and Hatch, Clubman and Convertible models currently on the roads in nearly 80 countries worldwide, MINI aims to offer a varied and exciting range of small premium cars to customers in the coming years. MINIMALISM technologies including Brake Energy Regeneration, Shift Point Display and Auto Start/Stop are key reasons to buy a MINI and have helped to position MINI at the forefront of highly efficient and environmentally aware performance car production. These technologies are sure to feature on future MINI derivatives.